A Senator from Louisiana; born in Arlington, Va., November 23, 1955; graduated from Ursuline Academy, New Orleans, and Louisiana State University, Baton Rouge, 1977; member, Louisiana house of representatives 1980-1988; Louisiana state treasurer 1988-1996; unsuccessful candidate for Democratic gubernatorial nomination 1995; elected as a Democrat to the United States Senate in 1996; reelected in 2002, and again in 2008 for the term ending January 3, 2015; chair, Committee on Small Business and Entrepreneurship (One Hundred Eleventh to One Hundred Thirteenth Congresses). 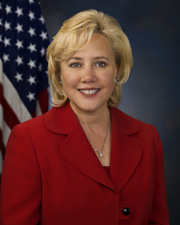 Landrieu became chairwoman of the Senate Energy and Natural Resources Committee in February and has used her influence to dictate a committee agenda that has so far focused heavily on the interests of Louisiana's oil-and-gas industry. She was instrumental in securing passage of a bill that requires 80 percent of the fines collected from BP for damages wrought by the Gulf of Mexico oil spill to be used for Gulf Coast restoration. George Washington University Graduate School of Political Management "school of applied politics, legislative affairs, strategic public relations, and global advocacy"